User experience (UX) is a fast growing discipline that is widely recognised. The field is unregulated and, as demand has grown, there has been a decrease in the level of skill and experience of the average practitioner. In digital projects, there are often limited budgets and time constraints. It is rare that a practitioner is able to use all the tools and techniques of the ideal user-centred design process. Also, unfortunately, research is often the first thing to be downsized or removed. This has the effect of reducing the connection with the discipline of HF/E. As we move away from mouse control to touch, gesture, voice control and virtual reality, there will, however, be a greater demand for the skills of HF/E. Lisa and I have evolved our careers in a very similar time period where technology and digital experiences are often ahead of the research and understanding of what works best (in terms of fit for humans). The PET technique that Lisa illustrates later in the chapter is a good example of where many of our cognitive psychology / ergonomics skills are now being turned to create more compelling experiences. One of the concepts that I keep returning to, which I learnt during my degree in HFE was the work by Stephen Pheasant. Although this work was published well before digital (web) experiences, they hold true today as they ever day. Lisa summarised the position within UX that there is a miss-held belief that a UX designer or UX developer can fix all the issues with their own designs. At this point it is Pheasant’s “The design is satisfactory for me, therefore it will be satisfactory for everyone” which comes to the forefront of the conversation. After all, if the design isn’t based on any customer input, then who is the design actually fit for? At this point I feel that we are at a cross roads where the very term User Experience could be hijacked by the people that think they do it but don’t. The main musing point for me was – what is the role of HF/E (as performed by formally trained practitioners) in UX? As an Institute is there more to be done in communicating why its important that development teams don’t just make do with a coder who has some experience in usability. Its always going to be tough to draw a clear line between what is UX and what isn’t. As the chapter brings out there is a convergence between the digital and the physical world. 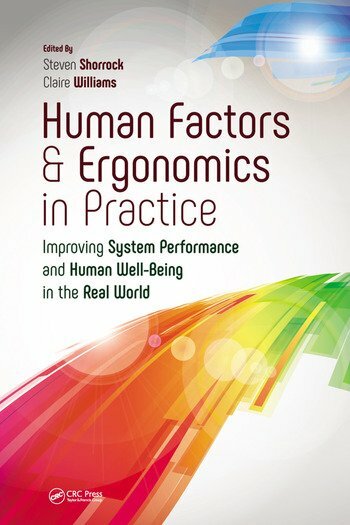 However, for me a simple heuristic is that if there is an artefact involved then it should have a human factors person involved in the conversation. Other reflections relate to the discussion about research being the first thing to be dropped when budgets are squeezed. Sadly, this is not completely unfamiliar with some clients in the development of physical products. Although, I wonder if this is a less of a problem. The cost of failure with a physical product is often much more tangible. Decision makers tend to think in terms of tooling costs, stock, recalls, product refresh costs, etc. Conversely, ostensibly at least, software and code can be introduced to the market and then readily updated based on real-world feedback. The world of UX is often dominated by mantras to do with failure (e.g. fail fast, fail often), hacking one’s way through a project is not only tolerated, it’s often encouraged. While this may be great for an alarm clock app, it’s simply not acceptable for many of the markets that HF/E has traditionally served. Medical apps simply need to work when they hit the market. Safety critical concerns aside, there are also concerns about damage to reputation and end-user dismissal of products that fail to meet minimum requirements. In the future, I would like to see a greater awareness and clarity of what very specialist HF/E practitioners can bring to the world of UX above and beyond others working under the same job title. I am certainly not advocating that we push for only chartered members working in this area. Above anything else, there simply aren’t enough of us to go around. However, I would like to see representation on the most critical projects and certainly those with safety-critical concerns. For this project managers need to understand the differences between these roles and have an appreciation of when they are working on the fringes of two or more disciplines. This entry was posted in Part 3: Domain-specific issues and tagged design, HF/E competence, usability, UX. Bookmark the permalink.